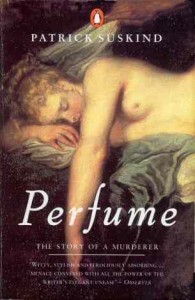 Perfume is a story that generated some controversy on the night of our meeting. It could almost be called a page turner. The book is concisely constructed and beautifully written, with a serial killer who provokes a morbid fascination. But it is outlandish, a tale of supernatural power in a sociopath. So, what is the point of it? Is it a fable? A portrayal of our baser instincts and subliminal nature? A satire of society? A political commentary on personality cult? The society it describes is brutal. The anti-hero is repulsive, his actions are depraved, and his thoughts macabre. With great gusto the author drops you into the thick of it – into the most squalid circumstances in the most putrid area of the most polluted city in the stinkiest century in the history of mankind. You can see, hear, feel and smell every pustulous detail. In this setting and with clinical detachment Süskind relates the life of Jean-Baptiste Grenouille, a man with a shark-like sense of smell. The book follows him through birth, abandonment, education, apprenticeship and independence. At every turn Grenouille encounters complacency, self-righteousness, vanity and greed, but being a clever boy, he learns how to analyse weakness and manipulate those he needs in order to follow his passion – the discovery and distillation of scents. His quest leads him to Grasse, famous for its floral perfumes, where he detects the most beautiful scent in the entire world in the person of an enchanting red-headed pubescent girl. Grenouille is a character who conflates the material, the emotional and the moral. Scent is everything to him, his only way to interact with the world. Unpleasant scent has no value, while beautiful scent inspires love, is sought at all cost, and can even transform a man into a god. In some ways this is a familiar story, the obsessive pursuit of perfection in a horrifically imperfect world, and when the hero remains on this course, there can only be one outcome. Peculiar as his vision may be, Süskind writes subtly and sensitively, so that even the cold monstrous Grenouille engenders some sympathy. Neither are the other characters exaggerated nor oversimplified. In the pitiless world that Süskind describes, their ignorance and failings are sadly all too comprehensible.